Modern Machine Shop 81 was devoted to the care and maintenance of belt-driven equipment. The article, part of an extensive three-part series, was authored by the chairman of the Engineering Commission of the American Leather Building Association, along with two professors in machine design from the Massachusetts Institute of Technology, which was then, as now, one of the top technology schools in the country and a leading developer of industrial innovations. All three articles are a mix of practical dos and don'ts, technical guidelines and explana- tions of best practices. They are illustrated with tables, diagrams and numerous photos. Clearly, this was a serious topic deserving serious treat- ment. As the first paragraph in the second article states, "the engineering requirements and the successful use of leather belts are just as rigid and necessary as in any branch of science." 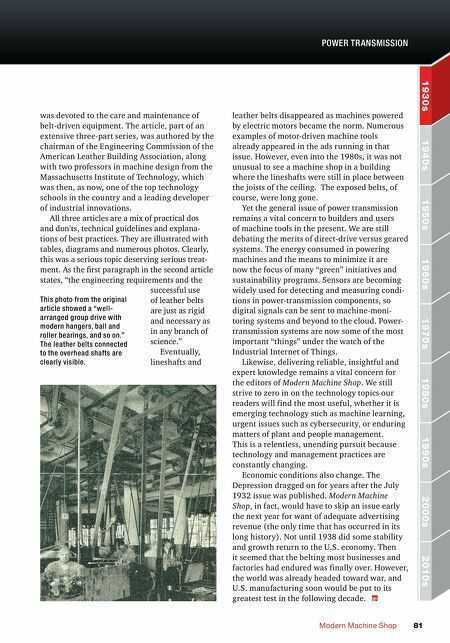 Eventually, lineshafts and leather belts disappeared as machines powered by electric motors became the norm. Numerous examples of motor-driven machine tools already appeared in the ads running in that issue. However, even into the 1980s, it was not unusual to see a machine shop in a building where the lineshafts were still in place between the joists of the ceiling. The exposed belts, of course, were long gone. Yet the general issue of power transmission remains a vital concern to builders and users of machine tools in the present. We are still debating the merits of direct-drive versus geared systems. The energy consumed in powering machines and the means to minimize it are now the focus of many "green" initiatives and sustainability programs. Sensors are becoming widely used for detecting and measuring condi- tions in power-transmission components, so digital signals can be sent to machine-moni- toring systems and beyond to the cloud. Power- transmission systems are now some of the most important "things" under the watch of the Industrial Internet of Things. Likewise, delivering reliable, insightful and expert knowledge remains a vital concern for the editors of Modern Machine Shop. We still strive to zero in on the technology topics our readers will find the most useful, whether it is emerging technology such as machine learning, urgent issues such as cybersecurity, or enduring matters of plant and people management. This is a relentless, unending pursuit because technology and management practices are constantly changing. Economic conditions also change. The Depression dragged on for years after the July 1932 issue was published. 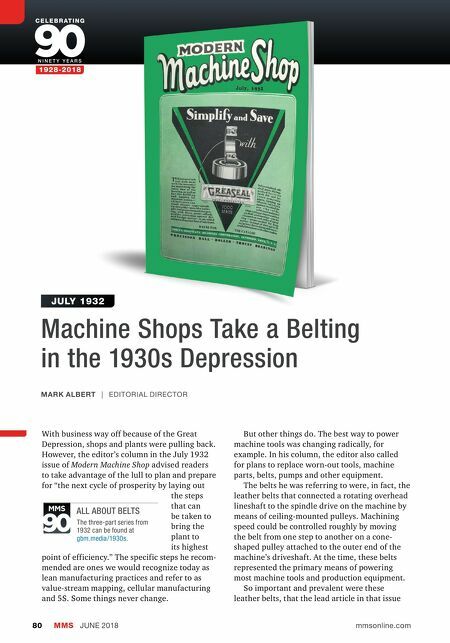 Modern Machine Shop, in fact, would have to skip an issue early the next year for want of adequate advertising revenue (the only time that has occurred in its long history). Not until 1938 did some stability and growth return to the U.S. economy. Then it seemed that the belting most businesses and factories had endured was finally over. However, the world was already headed toward war, and U.S. manufacturing soon would be put to its greatest test in the following decade. 2010s 2000s 1990s 1980s 1970s 1960s 1950s 1940s 1930s POWER TR ANSMISSION This photo from the original article showed a "well- arranged group drive with modern hangers, ball and roller bearings, and so on." The leather belts connected to the overhead shafts are clearly visible.